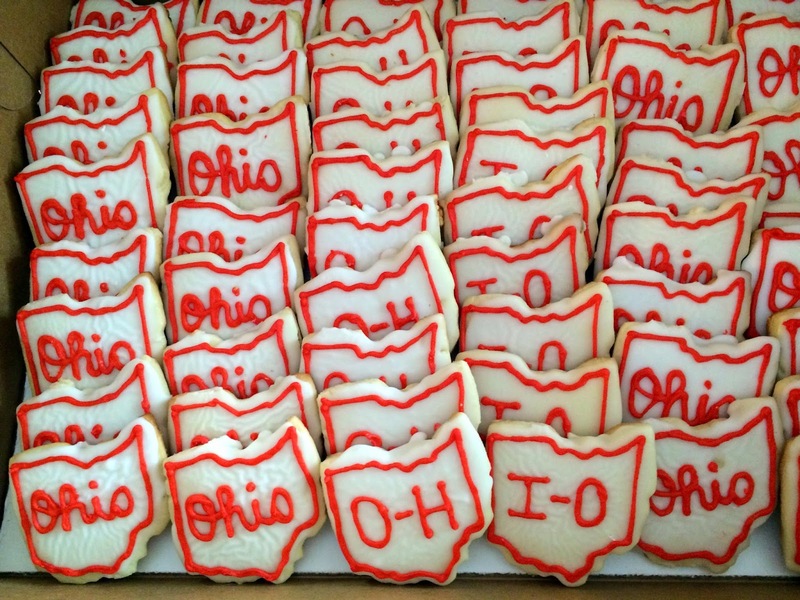 Last Saturday, September 20th, we drove to Columbus to celebrate Janet Anderson's 85th birthday. I guess I can say that I am related to Janet by the very end of a shirttail. Janet is my sister's late husband's aunt. I got to know Janet through family gatherings and also lunch dates with my mother and Janet. Having lived in Columbus for 37 years, I was able to have visits with Janet even when Linda and Geoff were not in town. My sister and her family would visit us for Thanksgiving. Janet was always invited and would bring her famous sweet potatoes for our Thanksgiving Feast. Yes, it is in a classroom....but that is another story. If you read my last blog post you know that Ray and I got married five years ago on September 19, 2009. That happened to be Janet's 80th birthday. We did not know that when we planned our wedding, which was small and in Toledo. We realized that Janet was probably disappointed that Geoff and Linda would not be able to celebrate her 80th birthday with her. Geoff's siblings and cousins planned a party and everyone chipped in to buy her a big screen television. The best we could do was take a picture of all of us unable to attend and send it to her. 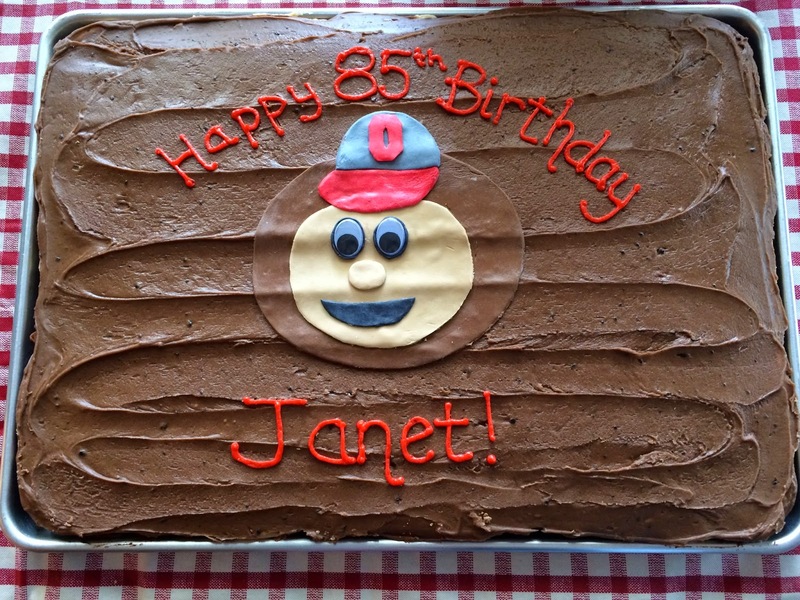 Janet's 85th celebration was planned by her nephew and niece, Danny and Claudia. (Geoff's siblings) All of the cousins took part to make it a perfect day. People traveled from all parts of the country: Oregon, Washington, D.C., Florida, Virginia, Kentucky, Illinois, Ohio, Indiana and Alabama. Most of the nieces and nephews arrived Friday night. Ray and I arrived Saturday morning. We met my sister at her hotel. Linda and I then went to Katie Keckley's to pick up the cake, cookies and cupcakes. We wanted to get these treats to Janet's before people began arriving for the birthday open house celebration which was to begin at 2:00. When we arrived at Janet's people were already there. There was a table in the living room packed with hor d'oeuvres. Walking through the den/office area I noticed the desk covered with birthday cards. Janet saw us and waved us over to meet some of our shirttail cousins. Some I knew, some I knew only from recognizing their names. All were friendly and welcoming...or maybe it was because I was carrying a Brutus Buckeye cake. Danny cleared off a place on the food table for Brutus and the rest of the treats. This table, also, was overflowing with food. The first thing Janet showed me was the iPad that everyone had gotten her. She was thrilled and could not wait to learn all about it. Every time someone new arrived, (which was often and all day) Janet would introduce everyone. Sitting back I could see that she had touched many people in her 85 years. There was lots of laughing and story telling. I wish I had recorded it all, but it was fun just living the moment. Janet told Ray that he was in charge of taking the group pictures. Of course, this was one of the few times he forgot his SLR camera and just had a point and shoot. There were others with cameras, though, so no worry. We all headed outside for the group pictures. It was a beautiful day, sunny, blue sky and perfect temperature. Chairs were lined up and people began finding their places...slowly. The teacher in me emerged and I began directing people on where to stand. I fear I sounded a bit brusque...but years of getting students to pose in groups took over. We took a number of pictures, some with just cousins, some with just the women, and some with everyone. I could have taken many more...but people soon began wandering off. Danny said, "You were lucky to herd these cats for this long. I think that is enough." Janet with Nieces and Nephews and Ari, Danny's Dog. I have made a slide show of some of the pictures. I figured that is the best way to get a lot of pictures on this post. As we were leaving, one of Janet's friends, Daphne, was reading a poem she had written for her. I am so glad that she sent it to me so that I can include it here. Read it and learn some more about Janet! We are so glad to be here with you today! Ray and I left before the cousins. I talked to my sister the next day and learned that we missed more laughs and fun. One thing that must be a family tradition at such gatherings is where Chris Dorval does his levitation trick. Linda said that many cousins were levitated...and even Janet joined in. Wow... I wish I had some pictures of that. Maybe someone there took a picture and can send it to me so that I can include it in this post. It was a wonderful celebration. Fun was had by all. 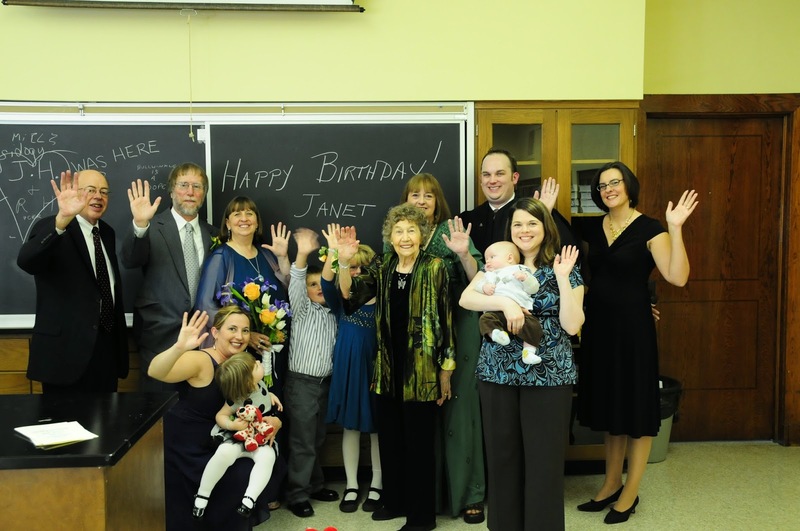 I look forward to joining all in five years when we have Janet's 90th birthday celebration. I will make sure to stay for the levitation trick next time. "She's Got a Ticket to Ride"
Woe to the Man Shopping in Rothenburg!